The Atlantis 38 puts a new spin on its rock ’n’ roll predecessor. In these accelerated times, next-generation products are introduced before the previous versions show even a hint of age. Take a spin on the new Atlantis 38 and you’ll see this first hand, and also get a sense of how boaters can reap the benefits of the trend more pleasurably these days than ever. 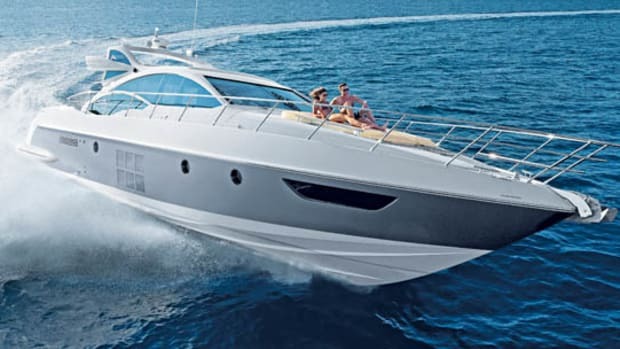 Though the name Atlantis Yachts might not be all that familiar to you yet, the brand is actually owned by Azimut-Benetti, the seemingly omnipresent player in serious superyachts and flying-bridge cruisers that created the brand back in 2001 in order to reconnect with its roots. 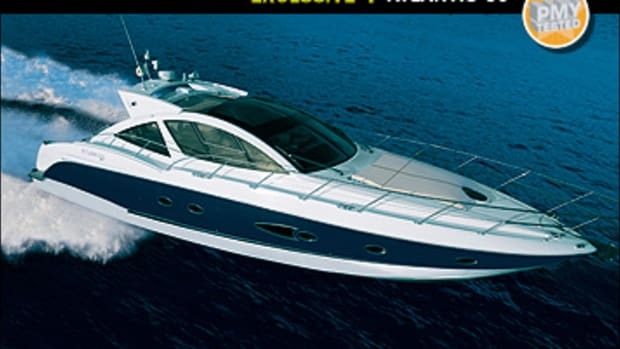 The original Atlantis models were existing designs from the Gobbi shipyard, which was taken over prior to the rebranding. 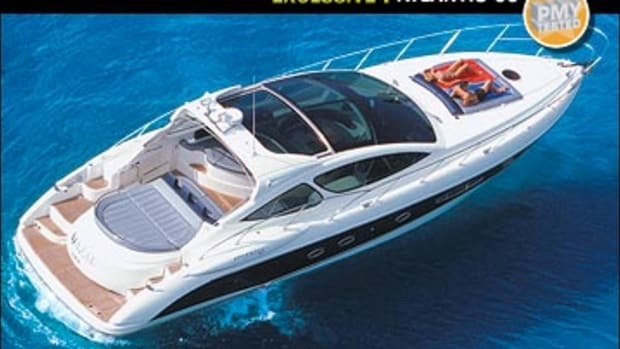 New designs were soon fed into the range, none of which made quite the impact of the extraordinary Verve 36, a great-looking dayboat with walkaround decks, three helm seats, two berths, plenty of horsepower, and a unique sideless hardtop that swept back over the cockpit like Jerry Lee Lewis’s mop in a headwind. It had rock ’n’ roll written all over it, and lived up to the billing. 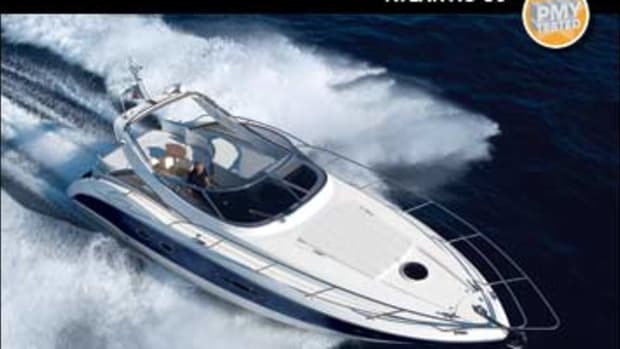 But if the Verve was a boom-time boat, the Atlantis 38 is a product of a leaner era. She is clearly intended to excite the same passions, but with the addition of a more serious, family-oriented side as well. So the cockpit is more conventional—with seats, sunbeds, and a table—and there are two cabins down below. With a dark-tinted windscreen and those orange cushions she still rocks, of course, but the volume has been turned down because the kids are in bed. Almost everywhere you look there is evidence of how much thought has gone into the 38’s design. The concertina doors to both the forward cabin and the shower compartment save space in a remarkably simple way. The tabletop needed for the (optional) saloon dinette conversion stows neatly in its own slot in the forward hanging locker. A lifting backrest section in the cockpit cushion is a small but significant addition to the comfort and versatility of the boat’s seating areas. The entire cockpit sole lifts on a hydraulic ram to reveal the engine compartment, requiring no more preparation than the removal of a small corner cushion. Whoever pulls cooking duties can work in daylight thanks to a glass panel above the galley. The helm seat has a lifting bolster so you can steer either sitting or standing up. And for in-harbor work there is a folding platform to stand on so you can stick your head through the sunroof for the best all-round view. 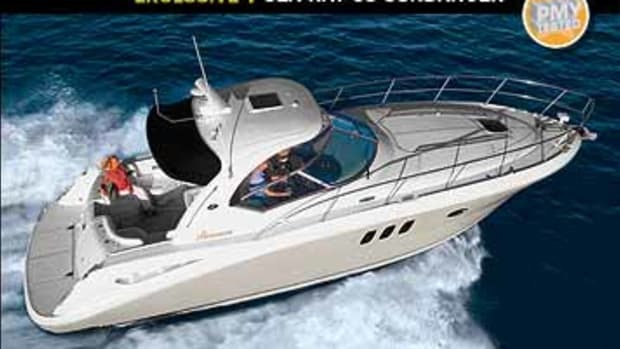 Such examples of practical design are of course de rigueur on boats like this. Space is tight, and style is king. Compromises are compulsory—but the more elegant they are, the better. Just as important to quality of life aboard the Atlantis is the amount of stowage that has been built in, from the useful little oddments tray under a hinged lid on the port side of the cockpit to the practically sized drawers and hanging locker in the forward cabin. Not much space is wasted. 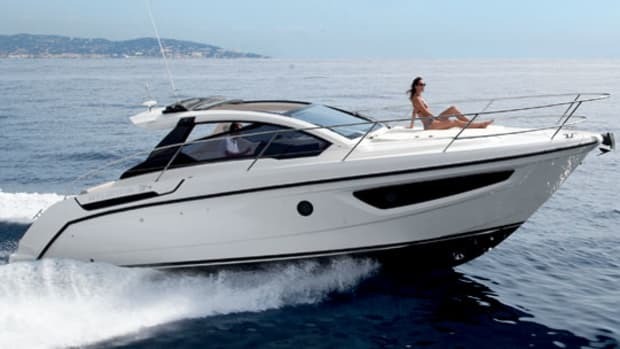 These details are expensive to incorporate, and in this most cutthroat of market sectors boatbuilders will often be tempted to claw back costs in less obvious areas in the hope that they might not show up amid the smooth talking and spotlights of a boat show. Crucially, I couldn’t find any areas onboard the 38 that gave rise to concerns about construction quality. Lifting hatches and peering into hidden corners revealed nothing but carefully clipped wiring, well-run plumbing, and well-finished fiberglass lamination. Up at the bow, the windlass is mounted on a seriously heavy-duty piece of stainless steel that is bolted into place on fiberglass laminates, which are very chunky indeed. It really does look immensely strong. 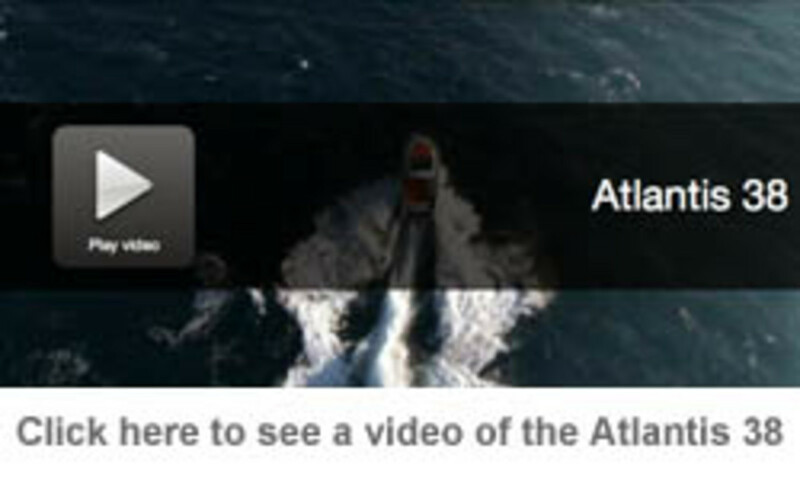 Atlantis uses an unadorned standards list to keep the price low. The basic boat is ready to go, with a full-size forward berth in a bright and spacious cabin with 6-foot 1-inch headroom (and two inches more in the saloon). 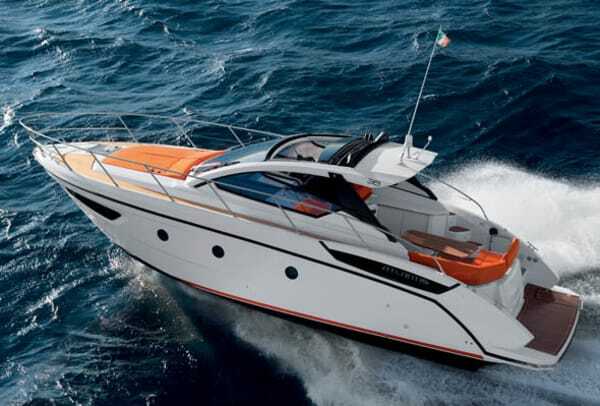 There is a very workable aft cabin with excellent headroom in the entrance area, an adequate 2 feet 7 inches of clearance over the berth, and a neat and practical head and galley. The 260-hp diesel stern drives are standard, along with all the instrumentation you’ll need for weekend cruises. The sturdy cockpit table seats five, and can be lowered to make a sunbed. 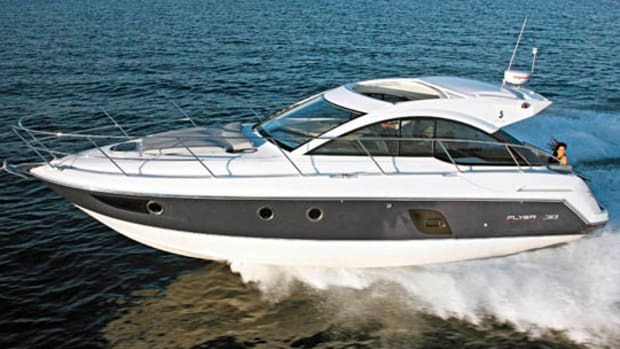 The 38 is a boat that comes with few frills, but if you want it loaded, from fancier electronics and teak decks all the way up to air-conditioning and a diesel generator, that’s up to you. Our test boat had all of that, plus the bigger engines. Off Savona, Italy, conditions were perfect, with a moderate swell rolling in, augmented by a light chop on top—just the fun side of challenging for a boat this size. And what fun we had. 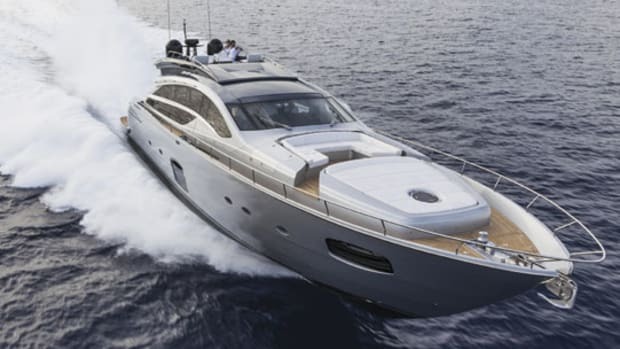 With 17.5 degrees of deadrise aft and plenty more forward, the 38’s hull ironed out the seas with little fuss. The minimum planing speed we managed, around 19 knots, would have been fine for passagemaking in these conditions, upwind or down. The only slamming we encountered was deliberate, as we banked off the crests to wrong-foot the hull, but doing so induced no creaks or groans from the structure. We could have carried on all day and the crew would have complained sooner than the boat. Forward sightlines were at times a little marginal: I’m around 6 foot and started my test drive by standing at the helm but ended up sitting, to benefit from the height of the seat. In flatter water close inshore this wasn’t an issue. Running downwind and across the seas we recorded a two-way average maximum of more than 35 knots. In flat conditions, with more finely tuned leg trim, we might have got a little more. 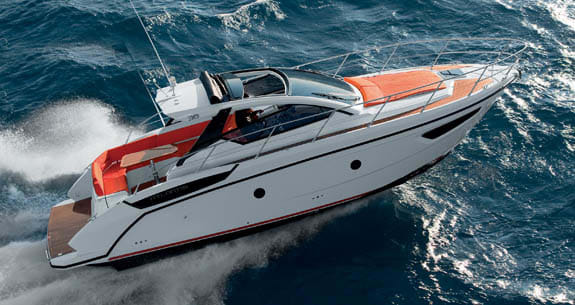 The optimum envelope for fuel-efficient cruising is around 26 to 33 knots. Volvo’s excellent DPH Duoprop sterndrives always give an exciting ride, especially when married to plenty of horsepower. The 38’s high-speed turning circle, heeled right over, seemed slightly shorter than its hull length. The steering was light but positive, and we were always in control. Power transmission was virtually instantaneous. Acceleration was lively. The experience was addictive. Atlantis’s new baby proved itself a worthy and slightly more sensible successor to the fabulous Verve, with all the practicalities and comfort of a cruising boat, combined with handling and performance that are seriously fun. Rock and roll! Noteworthy Options: Teak side decks $4,275 and cockpit $8,700; cockpit fridge $1,200 and barbecue $1,350; convertible dinette in saloon $1,088. 150 gal. fuel, no water, 4 persons, 100 lb. gear.